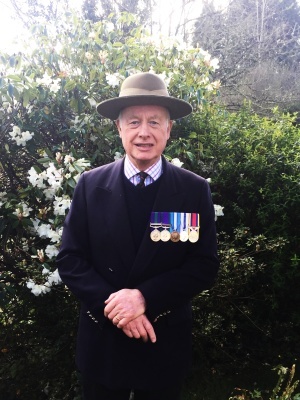 Having joined up for National Service in 1956, Colonel Mike Allen was persuaded to go for the Regular Commission at Sandhurst and was, later, commissioned into 7 DEO Gurkha Rifles in 1958 joining the 2nd Battalion in Singapore. He served in the Malayan Emergency, the Brunei Rebellion and the Borneo Confrontation campaigns, including 2 years as Second in Command Gurkha Independent Parachute Company operating in jungle deep patrol role. There followed further service in Hong Kong during the 1967 civil disorders and Red Guard Movement after which he was transferred to 10th PMO Gurkha Rifles 1973 and served with them in Cyprus 1974 /75 defending the UK Cyprus Sovereign Bases, following the Turkish Army invasion. After this he commanded 10 GR in Brunei 1978 to 1980. Col. Allen was given a Staff Appointment for the MOD (London) before being posted as Defence Attaché, British Embassy Kathmandu 1982 to 1985, Defence Attaché Bangkok, Thailand 1985 to 1988, then Commander British Gurkhas Nepal 1989 to 1992 (in which role he was responsible for the management of the Gurkha Welfare Scheme). Since then he has been actively involved in wildlife conservation in Nepal and in the Gurkha Welfare Trust and took over the Chairmanship of the South West Region Branch of the Gurkha Welfare Trust when he moved to Cornwall in 1999. The Band members come from a wide cross-section of employment including Paramedics, the Armed forces, the NHS and Education. Most of the band are 'Multi-Instrumentalists' and some also play with local brass bands etc. so we are not restricted to just playing traditional bagpipe music. The ages of our members range from 15 yrs to 80 and come from a wide catchment area - Penzance to North Cornwall. We even have a couple of members who live in Devon who join us for larger events. 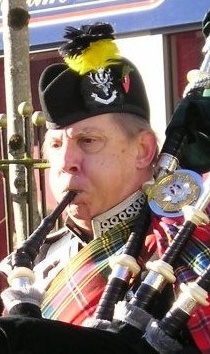 Tony, the Pipe Major, was born in Leicester in 1944. The family moved to Falmouth in 1949 where he has lived since that time. He taught at Cornwall College for 26 years then, after retiring, he took up learning the bagpipes as a hobby and joined the Cornwall Caledonian Pipe Band. 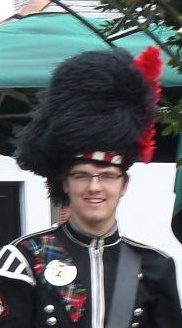 He left to join another band in 2008 but returned to the CCPB in 2013 and was made Pipe Major in 2015. Tony plays a variety of instruments but Bagpipes remain his obsession in life. 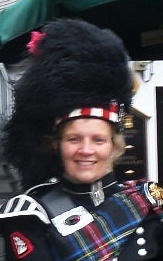 Linda is the Band Treasurer and Pipe Sergeant. 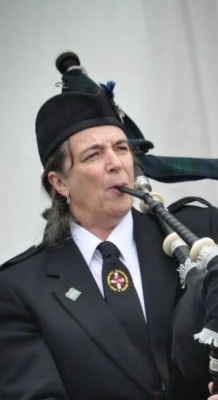 She started playing the pipes when she joined the Cornwall Caledonian Pipe Band a few years ago. Linda also plays the trombone in a local brass band. Tina was born and bred in Yorkshire to a Cornish mum and Scottish dad. Tina believes she was always destined to play the pipes. She was thrilled, therefore, to be given the opportunity to do just that after a chance meeting with members of the Cornwall Caledonian band 10 years ago. Her favourite tunes are the slow airs which remind her of the Scottish islands and highlands that she loves so much. When not playing the pipes, Tina will be either be working, reading or enjoying the beautiful beaches of Cornwall. Pedrek has been learning the pipes since 2014. A gifted musician, he has been able to pick up many of our tunes very quickly. He also studies the flute and sings with various choirs at school and in the county. Pedrek is a keen squash player. 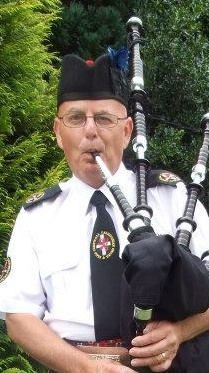 Don is the Band Quartermaster and has always had a passion for the bagpipes. He has been with the band since 2015 in which time his playing and tune repertoire has improved. 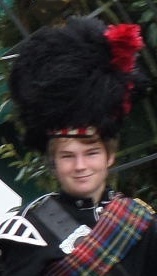 Don comes from a Scottish background so playing the pipes has been a lifelong ambition. Stuart is one of the original members of the Cornwall Caledonian Band when it was formed in 2002 and has recently rejoined us in 2017. Dave is the Drum Sergeant with many years expertise under his belt. Dave lives in Devon but travels down and attends the Band events in Cornwall. Sally joined the band in Autumn 2016 and decided to take on the snare drumming for the band. Besides the drumming Sally has taken on the Secretary`s post and is a gifted multi-instrumentalist who also plays the Clarinet and French Horn. Piran is a gifted musician who plays the drums with us as often as his A’level studies allow. He plays both the tenor and side drums keeping the band`s timing in order! Piran sings and also plays the clarinet. He is also a keen rugby player. Lynne is one of the tenor drummers and has been with the band since 2015. Lynne is proud to be Cornish and joined the band to be able to spend more time with her husband Don.